The Second Awareness allows you to perceive the stories contained within energy. You install fibers of light along the scalp that relay information from the third eye to the visual cortex, where it can be decoded and displayed in vibrant color. We add to that the information streaming in from the heart on similar fibers of light. These extracerebral pathways convey emotional and spiritual insight. The third eye registers facts, while the heart registers feelings. In this way, your seeing is tempered by compassion. On its own, the third eye is cold and dispassionate. By itself, the heart gets gushy and sentimental. Working together, the two become the healer’s most powerful sources of knowledge. Ninety percent of my students are capable of developing this skill. It is not a gift that only a select few are born with. The visual cortex is capable of envisioning anything. More than that, it decodes the information, deciphering images laden with symbols and meaning. Assume the prayer pose and go through the Second Attention practice while taking several deep breaths. Next, with the fingertips of both hands tap the center of your chest at the level of your heart. 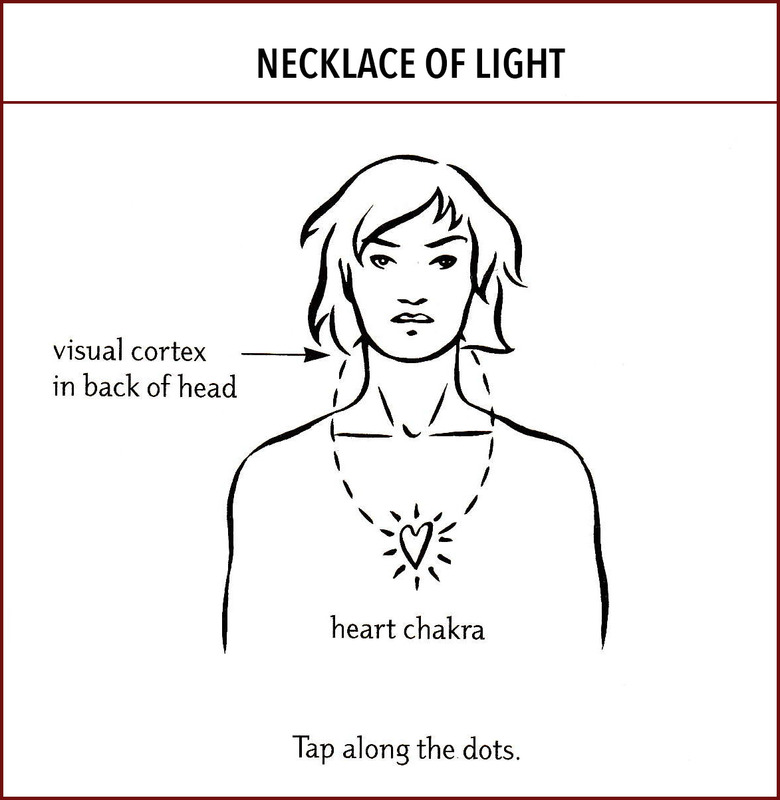 Tap the outline of an imaginary necklace of light going from your heart chakra to the back of your skull, to the visual cortex (see Necklace of Light illustration). Repeat this movement slowly and mindfully three or four times. Next tap on your sixth chakra, on the center of your forehead. Pat an imaginary band from your forehead to the base of your skull in the back of the head. Follow a line just above each ear (see Crown of Light illustration). Repeat several times. 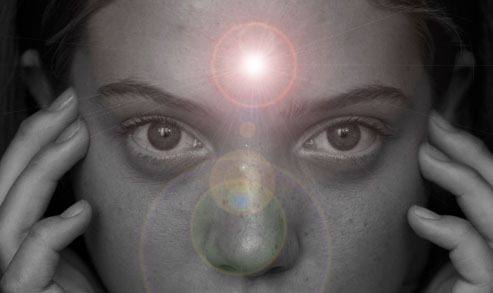 Now tap once again on your sixth chakra and follow a band along the top of your head (tapping with both hands along the midline) to the base of the skull. Imagine that you are placing a crown of light over your head. 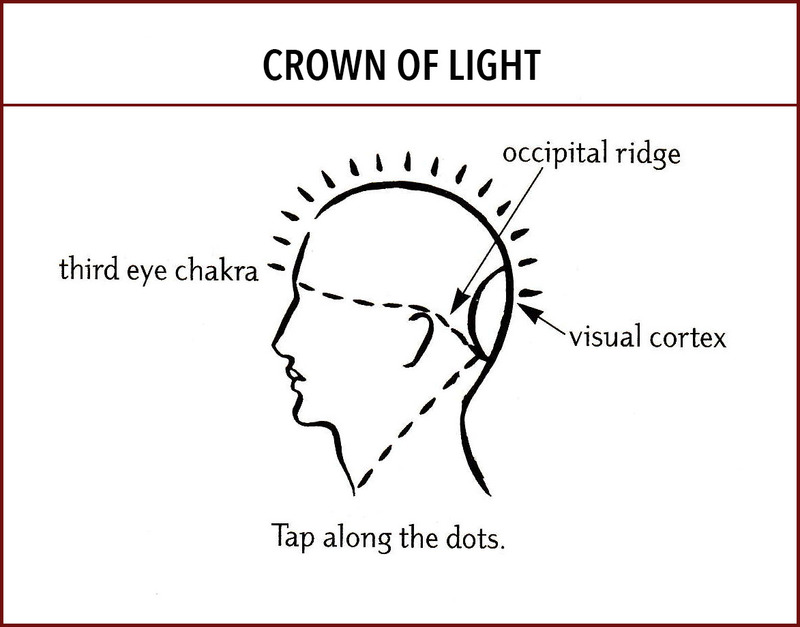 As you visualize this crown and necklace, you install extracerebral pathways to the visual cortex of the brain. Visualize energy running through these pathways to activate them. I visualize these pathways as shimmering fibers and imagine a golden light streaming through them, sowly at first, then picking up speed and intensity until the entire network is pulsing with light. I have found that some students very quickly develop the ability to see. Their luminous pathways are readily installed and begin transmitting information right away. For others it can take months or even years. The Second Awareness cannot be achieved through trying, which is an act of the will and belongs in the world of our ordinary (first) awareness. Energize the extracerebral pathways and let the visual cortex of the brain do what it was designed to do. You may realize one day that you have already been seeing for some time. It took me many months of practice, energizing the luminous pathways from my forehead and my heart to the back of my head, to achieve reliable results. One day I discovered that I had been seeing the Luminous Energy Field for months but simply had not been aware of perceiving it. It was a strangely familiar sensation. At first, I could see the Luminous Energy Field and the chakras only with my eyes closed. I would bring my hands into prayer pose, breathe deeply, and observe the energy streams as I moved my fingers apart. Then I could focus my attention on a client and perceive her luminous body. At first ordinary sight was intrusive and distracting. With time I have learned to see with my eyes open as well. I employ the Second Awareness only after obtaining a client’s permission (or before I board an airplane, to make sure everyone around me has a healthy Luminous Energy Field, a sure indication we will arrive safely). Practice seeing the energy field around plants and animals. Notice the filaments that extend from a pet to its owner, or from your houseplants to nature and to your own Luminous Energy Field. The recognition that we can see the world of energy and spirit is the greatest validation not only of your ability, but of the reality of the invisible world. Susan was in her early fifties when she enrolled in our Light Body School. A university professor, she had traveled with me to Peru nearly ten years earlier. We hadn’t seen each other in several years. In the course of our conversation, she told me that she was experiencing incapacitating migraines on a daily basis. When the migraines came she was unable to teach, or even to walk, for nearly an hour. Her doctors had found nothing physically wrong with her, yet the migraines persisted. She asked if I would scan her Luminous Energy Field to sense what might be causing her headaches. Susan sat against a white wall across from me. I dimmed the lights in the room. Softening my gaze, I brought my hands into prayer pose and entered into the calm state I have learned to associate with the Second Awareness. I immediately sensed that Susan’s seventh chakra was blocked. No energy flowed in or out of this area. Ordinarily the seventh chakra is like a fountain of energy gushing out the top of the head and streaming through the Luminous Energy Field. Pools of thick, dark energy swirled above her forehead. Slightly behind this spot I perceived an egg-shaped blot. The entire system pulsed, including this blot and the dark energy surrounding it. Although Susan’s doctors had found no medical reason to explain her malady, I sensed that there was a physical condition creating a buildup of pressure inside her skull. I performed an Illumination to clear the imprints for this malady and to extract the dark energy swirling around Susan’s head. When I scanned Susan again, I noticed that the object I had sensed earlier was still present. I insisted that she go back to her physician and have an MRI scan to provide a detailed view of the inside of her skull. Susan’s doctors were reluctant. There was nothing to justify an MRI, they said. It is an expensive procedure, and if Susan insisted on having it, she would have to pay for it out of her own pocket. She persevered, and with a smile she told her physicians that her shaman had ordered it. When the films came back they showed a growth the size of an egg next to her pituitary gland, in the center of her head, in a cavity that originally had been no larger than the size of a pea. This cyst had been creating a dangerous buildup of pressure in her brain. Two days later her surgeons successfully removed it and found that it was not malignant. After the surgery they explained to Susan that given the size of this cyst, she would have had a very short time left to live. The surgical intervention could not have been more timely. In a future blog, we’ll cover the way shamans track energy.